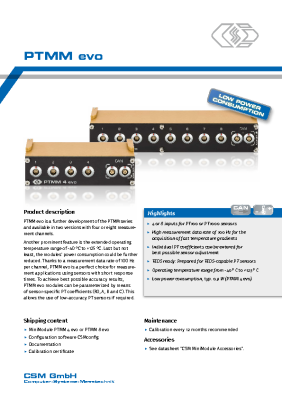 PT MiniModules | CSM Products, Inc.
PTMM evo is a further development of the PTMM series and available in two versions with four or eight measurement channels. PTMM evo thus expands CSM's product portfolio with modules for high-precision temperature measurements for use in distributed measurement applications in test drives and test benches. A measurement data rate of 100 Hz per channel, an extended operating temperature range of ‑40 °C to +125 °C and last but not least a reduced power consumption make these modules an excellent choice, especially for measurement applications using sensors with short response times. To achieve best possible accuracy results, PTMM evo modules can be parameterized by means of individual PT coefficients (R0, A, B and C). This allows the use of low-accuracy PT sensors if required.